Race sponsorship at Britain’s Most Scenic Racecourse is an exciting and cost effective way to promote a product or advertise your company, it is also a great way to celebrate special occasions such as birthdays and anniversaries. Name a race with a title of your choice (max 6 words). Judge the best turned out horse prior to your named race. Present a memento to the winning connections after the race. Photograph opportunities with the winning connections. Live television coverage on Sky Sports Racing (Sky Channel 415) and shown in 10,000 betting shops. Together with up to 20,000 live streams per race at home and abroad. A full page advert in the racecard. A promotional advert shown on TV screens around the racecourse bars and hospitality areas. Promotional announcements before, during and after the named race. Display of corporate banners in prominent areas such as the Parade Ring and Winners Enclosure. Publicity in regional and national daily newspapers. Inclusion on e-newsletters, social media posts and website updates. We can offer race sponsorship on its own or tailor packages to suit combining hospitality in private boxes or tables in our restaurant. Sole and corporate sponsorship is becoming increasingly popular. Contact us today and we would be delighted to discuss this wonderful opportunity with you. In addition to Race Sponsorship we offer various advertising packages for companies looking to advertise their business or products to racegoers attending each meeting, making it a prime location for your company to advertise. 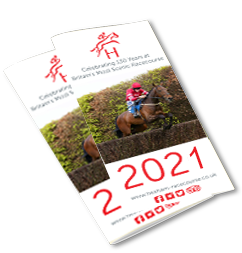 Printed in full colour and frequently used throughout the race meeting therefore providing continuous exposure of your company. Adverts from £70+vat per meeting or full season packages are available. An exciting area where horses are paraded prior to each race, jockeys are given final instructions by owners and trainers and racegoers are looking for the next winner. This makes the Parade Ring the perfect place to advertise your company on a banner. An annual site fee starts from £500+vat. The Hexham Racecourse complex is situated so that every area looks onto the course, making boards an effective way to promote your company to the raceday crowd and television viewers as well as visitors for non raceday events. An annual site fee starts from £1,000+vat.